When parking the car, the passenger or just the guest of the airport shall keep in mind that there are several options available. The Parking area has the capacity of about 800 cars, in the busy months, especially those in winter, the parking lot is full. 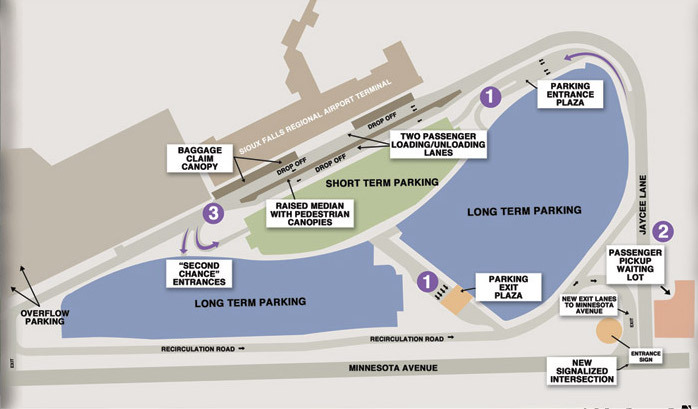 Short-Term Parking located across the terminal provides access for disabled drivers as well. The fee for the short-term parking is $1 for up to 1 hour, $2 for every additional hour, $14 per one day. Long-Term Parking is located near the Short-Term Parking and might be reached from Jaycee Lane. The fee for the long-term parking is $1 for up to 1 hour, $1 for every additional hour, $8 per one day, and $42 for one-week parking. Economy (South) Parking is located past the passengers terminal. The fee for the short-term parking is $1 for up to 1 hour, $1 for every additional hour, $7 per one day, and $35 for one-week parking. The passengers may wait for their taxi or a car at the waiting area located close to the entrance area on Jaycee Lane on the right from the terminal. The ‘Second Chance' entrance might be used drop off the passenger and then circle the parking area. The payment may be made ticketless with just the credit/debit card provided on the exit from the parking. On the official website of the airport, the one may find the up-to-date availability of lots on the parking. The FSD Airport allows making a reservation online on the website. The reservation fee is $4 per 24 hours.